A range of liquid cut-off filters that allows stray light to be checked at wavelengths from 200 nm to 390 nm. Note: The US Pharmacopeia now recommends the alternative Filter Ratio or Meilenz method which requires different references. This method is simpler to use with high performance, low stray light instruments, especially those with double monochromators. The Specified Wavelength method is, however , still accepted for instrument qualification. Stray light, also called Stray Radiant Energy or Power, is any light reaching the detector that is outside the Spectral Band Width selected for analysis by the monochromator. It is not absorbed by the analyte, so its effect is a negative deviation from the linear relationship between concentration and absorbance (the Beer-Lambert law), i.e lowered concentration results. 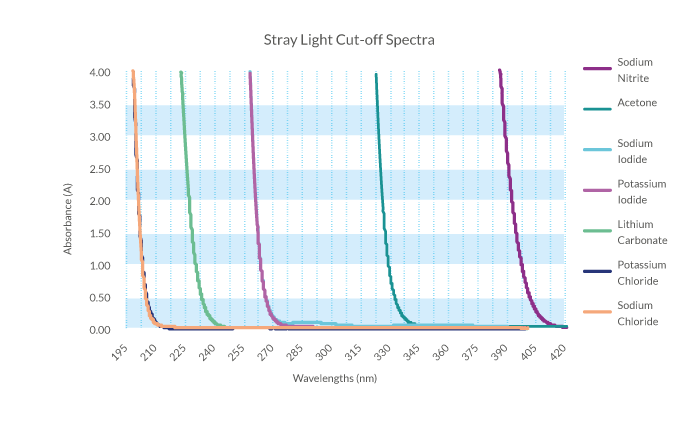 Stray light is usually measured using cut-off filters or solutions that cut off all light near the analytical wavelength, and transmit at all higher wavelengths. Below the certified cut-off wavelength, within the indicated usable range, any light transmitted must be stray light. Starna liquid cut-off filters allow stray light to be checked at a range of wavelengths from 200 nm to 390 nm. The European Pharmacopoeia states that at a path length of 10mm, a 12g/l aqueous solution of potassium chloride must have an absorbance ≥ 2A at 198 nm. Note that Potassium Iodide and Sodium Iodide have identical cut-off characteristics and are effectively interchangeable.